"Research-to-buy" is the new path to purchase. The Takeaway: Shoppers want to make informed decisions before they click "buy". Digital product content is central to providing the answers potential buyers have and delivering a compelling shopping experience. The role of a product marketer has changed. Consumers are actively looking for information about your product (and your competitors’ products) instead of waiting to be sold to. That means marketers have to spend more time as educators, providing customers with as much product information as possible. That advice comes from Nathan Safran, CEO and founder of Blue Nile Research, who spoke during our recent webinar with Internet Retailer, The Product Content That Sells On the Digital Shelf. He was joined by Mark Graves, president and CEO of Smart Furniture and Don Davis Editor-in-Chief at Internet Retailer for a discussion that centered around the power of product content in today’s distributed commerce marketplace. Consumers research products, sometimes very thoroughly, before buying. Often consumers use at least three channels when making a purchase, according to Safran. Often they conduct searches, check a branded web site and read customer reviews. "Engage customers with a story or use case." Organized and thorough product content is then of critical important to drive shoppers down the path of purchase. Before they visit your site, a majority of consumers want clear-cut data and stats about your product. When creating product content, remember that engaging your customers with a story or use case (based in fact) is very can also play a valuable role, Safran advised. You need to enable shoppers to make informed purchase decisions - encourage education - and that requires excellent product content. Eighty-eight percent of shoppers said that product content is extremely or very important to their purchase decision. If shoppers can't find the product information they need, they'll stop shopping or find a retailer or brand that does provide what they need. 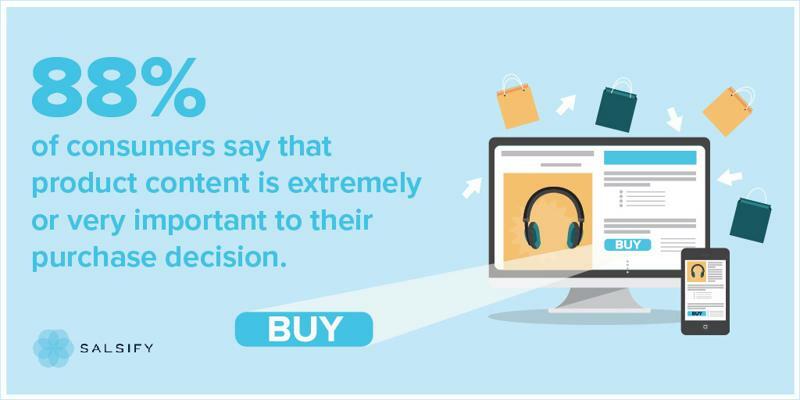 Our consumer research found the right product content is even more important than price to buyers. “If you do product content better than your competitors, then you win the sale,” Safran says. Mark Graves of Smart Furniture knows first-hand how to support buyers’ shopping experience over digital channels. Knowing that only 7% of furniture sales took place online in 2013, Graves wanted to bring an in-store buying experience to the web. His e-commerce site offers a personalized furniture-buying experience that learns the preferences of customers, and allows them to mix and match various components of furniture. In order to build such a robust platform for Smart Furniture shoppers, product content is central. Product content supports the algorithm that drives the personalization engine. There are thousands of components, and if product data is outdated, inaccurate or not detailed enough, then the shopping experience would crumble. "Product content should be central"
Graves recommended that retailers looking to build their digital experience spend time structuring their data and standardizing product content creation and syndication processes. Vendor data is messy and as products are added updated or discontinued, it requires updates over time. Having Salsify in place, helped Smart Furniture deliver a better and more effective shopping experience. For more product content statistics, insights and strategic recommendations, check out the full Internet Retailer webinar "The Product Content That Sells On the Digital Shelf."